The 2016 SoCal Honor Bowl was held September 1-3 at Mission Viejo High School in Sunny Southern Orange County. It was the first time that The Honor Bowl had a game on Thursday when Central Catholic of Modesto traveled to SoCal to play Cathedral Catholic to play in the Parochial vs Parochial Match up. Friday September 2 had two games: Oaks Christian of Westlake Village played visiting St. Joseph Prep who flew from Philadelphia, PA to participate in the Honor Bowl. St. Joseph Prep is the #1 team in PA and has one of the most explosive RBs D’Andre Swift who just committed to Georgia. Oaks Christian has been involved with The Honor Bowl since 2012 and their start QB Matt Corral wow the crowd with his athleticism. The Friday Night game was a rematch between Oak Hills of Hesperia vs Mission Viejo, the reigning 2016 D1 CIF State Champions. Saturday September 3 had three games starting with Serra Gardena vs St. Joseph Regional of Montvale, NJ. 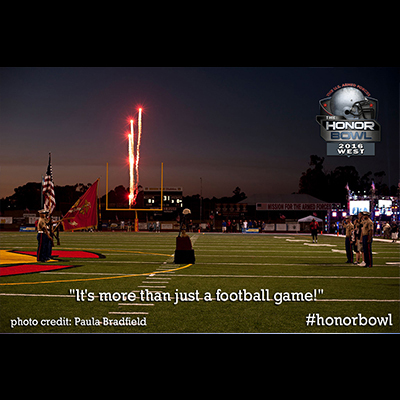 The Honor Bowl is blessed to have programs like Serra who have stated that they want to be part of the event yearly because of what it does to instill patriotism and pride for our Military who through their efforts affords us all to be able to come together and play a sport like football. Head Coach Augie Hoffmann of St. Joseph Regional lost a dear friend who was a military veterans and jumped at the opportunity to have his team and community involved in The Honor Bowl. Game two pitted Clayton Valley Charter Ugly Eagles vs Helix of La Mesa another powerhouse Charter School, This was the second time for both schools being in The Honor Bowl and it turned out as advertised – GREAT FOOTBALL! Ugly Eagle Players had a chance to talk about their plans to be in the 2016 Honor Bowl earlier in the year. The finale of the 2016 SoCal Honor Bowl was the most highly anticipated game in the nation when Corona Centennial Huskies matched up vs. IMG Academy Ascenders of Bradenton FL. The IMG players have never traveled to California and were totally stoked to have the opportunity to The crowd were ready for two national ranked teams with different styles played a high scoring game with a 0:20 deciding two point play. Head Coach Kevin Wright said it loud and clear why IMG wanted to play. Head Coach Matt Logan of Centennial again expressed his love of the event. The Honor Group would like to thank IPS Lighting for their creative majesty in the design and production of the incredible ‘tunnel’ with lasers, smoke and lights where each team entered the field before their game. Another shout out to Aaron Plunkett and his crew from #D1Bound who nailed it on the field for our pregame and post game festivities. Another amazing group that needs to be thanked are the US Marines from the 3rd Battalion 5 Marines who hit it out of the park by organizing a Marine 3/5 experience that three schools participated.